RadNet and vRad have deployed natural language processing tools to help them tackle over-utilization and help perform tasks that are challenging for humans. Positive or negative Medicare payment adjustments in 2019 will depend on performance to quality and other measures in 2017 under a new program called the Merit-based Incentive Payment System. Doing well on quality measures is important because they comprise 60 percent of a provider's total MIPS score – possibly 85 percent for certain specialties such as radiology. Most of the quality measures in MIPS are based on face-to-face patient encounters and are not particularly applicable to radiology. That's a concern for RadNet, a 300-center outpatient imaging provider. "We had to take full advantage of the few quality measures that were suitable to us," said Cheryl Sullivan, clinical workflow analyst at RadNet. "Our coding system was only partially effective in retrieving the necessary information for measures and needed to be checked frequently against the clinical record for accuracy. Manual coding is slow, expensive, and still must be checked for accuracy." RadNet required an automated system that could extract the relevant data accurately and reliably, Sullivan explained. That is where SyTrue, a vendor of healthcare natural language processing and artificial intelligence technology, came in. Two MIPS quality performance measures proved particularly challenging: 1) #405 - Appropriate Follow-up Imaging for Incidental Abdominal Lesions, and 2) #406 - Appropriate Follow-up Imaging for Incidental Thyroid Nodules in Patients. "This is because they are based on whether or not the radiologist recommended follow-up for certain incidental findings – that is, the fewer follow-up recommendations for the incidental findings, the better the performance score," Sullivan said. "The coding for these measures is complicated, i.e., is the finding one that qualifies for the measure (type, size); is the finding incidental; and then is any part of the radiologist's follow-up recommendations due to the incidental finding." RadNet's automated coding system and human coders struggled to extract the necessary information from the radiology reports and calculate the measure. So RadNet worked with a data scientist at SyTrue to write the natural language processing rules that could interpret specifications, pull the measure information from the radiology reports, and calculate the quality scores for measures 405 and 406. The rules were tested and refined repeatedly using sample reports. These rules proved highly reliable in producing accurate results, Sullivan said. "RadNet will use the information obtained through the system as part of our 2017 MIPS Quality submission," she said. "The RadNet MIPS team also uses the information to educate our radiologists and staff." 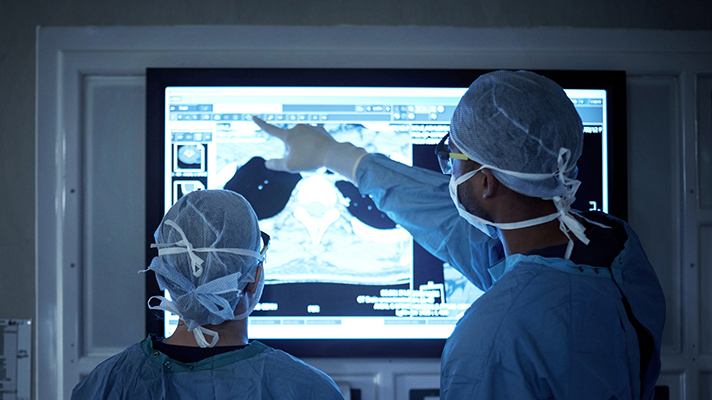 The NLP technology kept RadNet on track to meeting its MIPS submission deadline to CMS and RadNet believes that its affiliated radiologists will do very well under MIPS. "Before SyTrue, RadNet had two full-time equivalent coders doing nothing but reviewing cases for measures 405 and 406 along with a final approver who was auditing the cases," she said. "Now those staff members can be redirected to other, more productive work while keeping our MIPS-related costs down." Artificial intelligence and natural language processing in healthcare is growing out of the infancy stage. The technology has been proven to work, it's been put to use in real clinical settings. But adoption has been slow. Further, healthcare has only explored the tip of the AI iceberg. Other companies are working on NLP in healthcare. For example, NTT Data Services has partnered with Pieces Technologies, a developer of clinical artificial intelligence software, with the aim of helping hospitals improve care quality and decrease the costs by using natural language processing and AI-based systems. Specifically, NTT Data will integrate the Pieces Decision Sciences software into its technology suite that includes data integration services, analytics capabilities, cloud services and consulting. On another front, Shannon Werb, president and COO of vRad, a 500-physician teleradiology practice, observed that there is a tremendous amount of quantitative information locked up in any clinical note, specifically in a radiology interpretation. The vRad practice also is using SyTrue's NLP technology, and for a number of specific use-cases. "Identifying and extracting positive indications from a radiology report allows us to correlate those results back to the procedure, reason for examination, and ordering physician. This discussion is important as the industry works to implement decision support education and tools, and continues to work to manage over-utilization of imaging/radiation dose/etc.," Werb explained. Other use-cases include national peer group-based imaging benchmarking to help partners to understand not only what they look like on a national basis but also in benchmarking their services to other providers, and, identification of specific imaging data sets to use in training of artificial intelligence models, where NLP allows the organization to identify positive and negative training data sets. The vRad practice uses the NLP technology through a direct web services-based API integration from its data warehouse. Although SyTrue provides a user interface, vRad's primary use-cases have it directly integrating, pulling the SyTrue results back to the data warehouse and then correlating those results back through the analytics reports, which vRad provides to clients. "NLP technology is vital to the future of healthcare services, specifically in how we're going to be able to really tie outcomes-based/value-based care directly to the provider without directly interrupting the provider workflow," Werb said. "As an example in radiology, it is important to create an environment free from disruption for the interpreting clinician, not only from an efficiency perspective but really in ensuring we drive a quality result." NLP allows vRad to help physicians structure their output, capture quality-based measures and ensure complete billing efficacy, while also allowing vRad to leverage advanced technologies like AI to triage and validate physician clinical performance, he said.